Druids have the power to call upon nature's wrath. 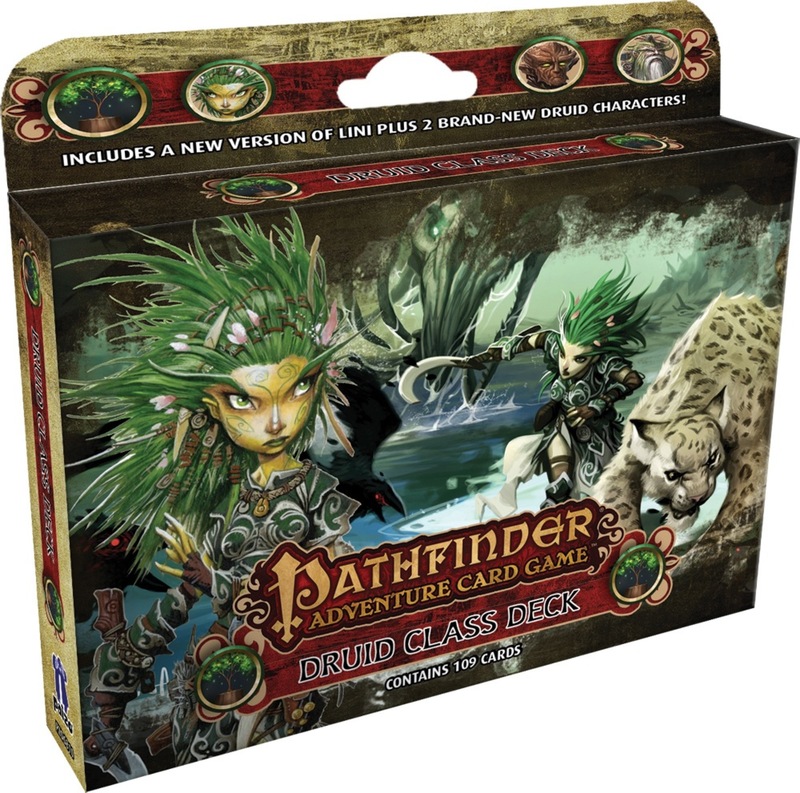 The Druid Class Deck allows players to bring these protectors to any Pathfinder Adventure Card Game Base Set. This 109-card deck contains 3 new characters, along with enough new and familiar allies, spells, weapons, and other boons to advance your druid through an entire Adventure Path. 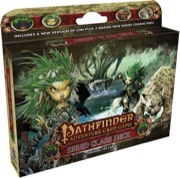 This deck can also be used in the Pathfinder Society Adventure Card Guild organized play campaign. Is that new background art, or from another product? My five year old daughter was really disappointed that Lini's snow leopard (Droogami) wasn't in add-on character deck pack. I see that you are finally releasing the Druid class deck and was wondering if Droogami will be in there. I remember reading something over on the BGG forum that including Droogami might not make sense for a card game, since only Lini should ever receive that card. Just wondering if this stance has changed with the release of this class deck. The Droogami ally card seen in this blog post is exclusive to Iconic Heroes Set #1. But the Snow Leopard ally card in the Skull & Shackles Add-On Deck (which also appears in the Ranger Class Deck and will appear in the Druid Class Deck) does actually depict Droogami. It's from the Bestiary section of Pathfinder Adventure Path volume 59.
yeah - and now all the class decks only have three characters instead of four. great. noticing the price didn't drop either. The class decks now have 3 characters instead of 4 for a good reason... so that the design team can tailor the boons in the deck for those three characters in a more useful way. The same number of cards are in the deck, so why would the price drop? Why would you expect a price drop? The number of cards in the deck didn't change - it's just that the cards now only have to provide options for three different character builds, not four. This is in response to complaints that there weren't enough reasonable choices for some character builds in the original decks. You might not notice this if you're just using the cards as extras for regular play, but if you're trying to build a character for organized play (when the class deck is your only source of cards) it's rather more important. Hm. Fair enough. I'm not involved in OP, so I wasn't aware of that. Complaint withdrawn. Why has the class deck been moved to December now. Logistics. It didn't get from the printer to the warehouse in time. See this thread too. Does anyone know if they released pictures of the new druid character cards? I saw Lini's character and class cards were shown in "Paul's Best Character Ever: Lini" post, but I have yet to see anything on the other two druids (Maznar is one of them I believe). I'm thinking about getting the class deck but want to see who the other two druids are before I make my decision. Any word on when the downloadable character sheets will be updated to include the characters from this class deck? Our Digital Content Director says "These will be added to the product page when the product officially releases. The release date for December is Wednesday, December 16 :)"
Vic, I was curious about the release dates for Paizo. Are those dates posted somewhere on each product's page? Also, how does that date correspond with when we would receive the product that we've ordered on Paizo.com? By that I mean, does the item ship on the release date or is the attempt to have it delivered by the release date? Each month there is a thread like this one which gives that month's releases, street date, and shipping dates. Street dates are when other retailers are allowed to begin selling the product. If you order from Paizo, it may ship before street date, but there is no guarantee. Though they try each month to have all subscriptions shipped out before street date. There's also this page which takes a slightly more long-term view, and is therefore a bit less specific—it tells you whether a product is expected to begin shipping early in the month, in the middle, or late; the retail release date is generally set 2–3 weeks after that, so if something says it begins shipping in early January, the retail release date is expected to be late January. My deck had a weird sorting anomaly. It seems the last ally and the first blessing had swapped places. Should I be worried? Cards occasionally get out of order—you can read this for more details. But do check to make sure you have 110 cards (including the rules card)!